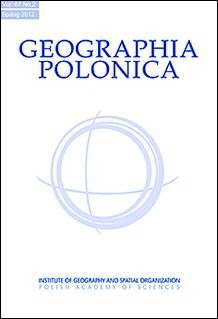 Institute of Geography and Spatial Organization PAS together with Ministry of Regional Development of the Republic of Poland, Polish Geographical Society and Digital Repository of Scientific Institutes invite on Warsaw Regional Forum 2013 - Territorial capital - concepts, indicators & policy (8-12 October 2013, Warsaw). On 1 October 2012 the English version of a new web portal of the Institute of Geography and Spatial Organization PAS has been launched. The old version of the website functioned several years. It was time to change the form, content, functionality and website appearance. We inform, that in 5th of July 2012 under-secretary Marceli Niezgoda and prof. Marek Degórski, signed agreement on cooperation between Ministry of Regional Development and Institute of Geography and Spatial Organization PAS in the range of spatial management and territorial dimension. We are pleased to inform you that number of records (titles) in our Digital Repository exceed first thousand. Institute of Geography and Spatial Organization PAS invites on Warsaw Regional Forum 2011 - Functional regions: towards a new paradigm of territorial and cohesion policy (19-22 October 2011, Warsaw).